Vietnam has beyond beautiful beaches, dessert sand dunes. Deep in Vietnam’s jungle blanketed mountains, there are the most thrilling natural attractions of the country, which are waterfalls. When the ancient wend their own way through the high land of the country, water cascades over the precipices, carving the rocks and earthen landscapes away. Some of them have been modified by humans, while others have been dealt by the Mother Nature. However, all of them are incredible. Vietnam has a lot of waterfalls from North to South. Here are some of the most beautiful waterfalls in Vietnam you should not skip. Located in about 7 km to the northeast of Tam Giang Commune, Dak Lak province, Thuy Tien waterfall is one of the most beautiful waterfalls in Vietnam. 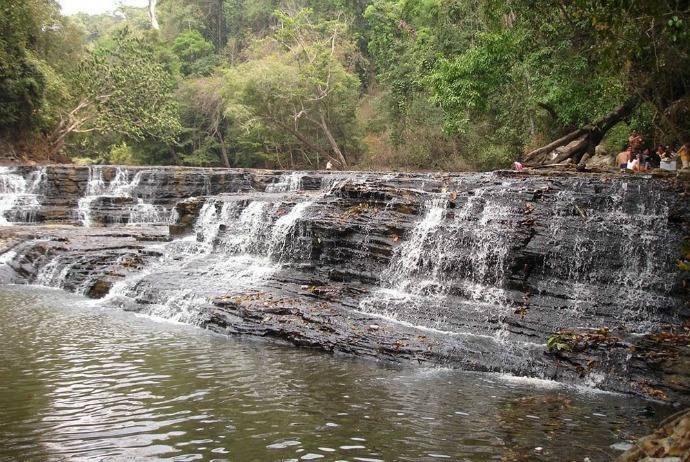 Thuy Tien waterfall is poetic with many stones of different shapes as well as sizes heaped up through the time. Visiting this place, tourists could immerse themselves in the nature and listen to the nature in a majestic forest. At the top of this waterfall, water flows down onto those rocky terraces, thereby creating white spume – all of which create a fanciful, lively picture of the mountainous landscape of the Central Highlands of Vietnam. The waterfall contains three layers. The first having low slope with many steps; the second possesses rocky tiers. Many shallow and small lakes in which tourists could take a bath are created here. From afar, water looks like those blossoming white flowers under the golden sunshine of Central Highlands. The third layer with water falling vertically to the ground has a deep lake, in which water flow gently and through tranquil jungles. 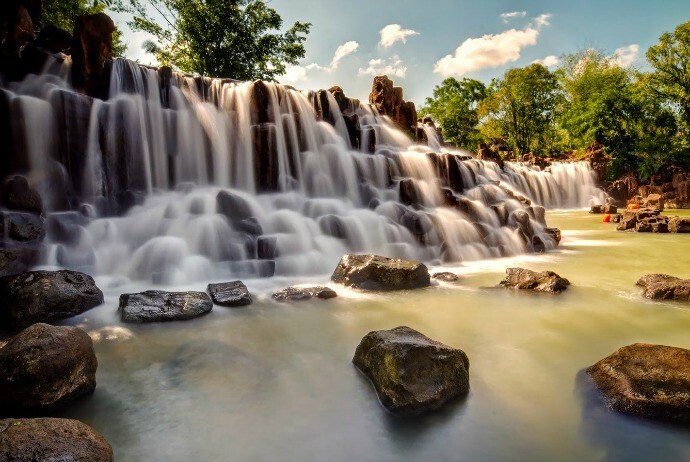 Along with other beautiful waterfalls like Trinh Nu (Trinh Nữ), Dray Sap, and Krong Kmar, Thuy Tien waterfall is among great places for tourists to visit. Being a fairy hidden in the Tay Nguyen (Tây Nguyên) green jungle, Thuy Tien waterfalls invites travelers both from near and far come to contemplate its poetic and charming beauty. 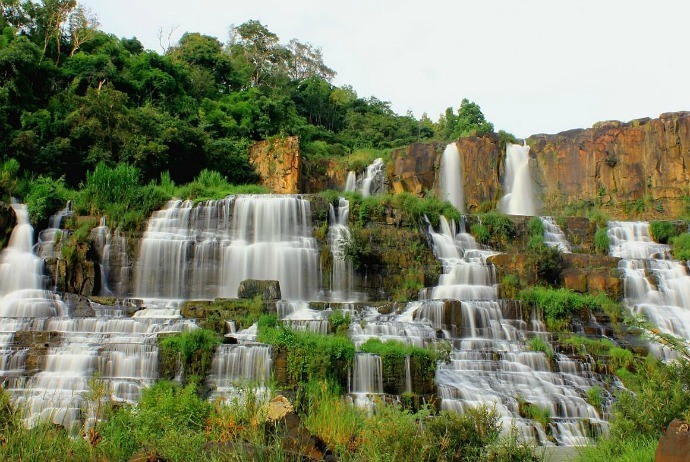 Also known in Vietnamese as Voi waterfall, Elephant waterfall is situated about 25km to the southwest of Dalat (Đà Lạt) city, in Nam Ban townlet, Lam Ha (Lâm Hà) District, Lam Dong (Lâm Đồng) province. Having a height of 30m, and a width of 15m, this waterfall look likes some elephants swimming together. This waterfall which is accompanied with a folk woeful, faithful, and majestic story of love is considered a natural landscape. Here, the transparent water flowing through those granite mountain sides creates spectacular scenery, particularly when the waterfall is illuminated by beautiful sunlight, the 7-colored rainbow will happen. Lying about 50 km away from Ho Chi Minh (Hồ Chí Minh) City, Giang Dien waterfall is a place of serenity. Despite it is not too popular among international travelers, it offers a realistic eco-tourism system for tourists to come to explore and relax. Situated in the southern area of Dong Nai (Đồng Nai) city, Giang Dien waterfall has a surrounding area containing hills, a valley, forests, and a lot of flowers blossoming throughout the year, which emanate the peacefulness. 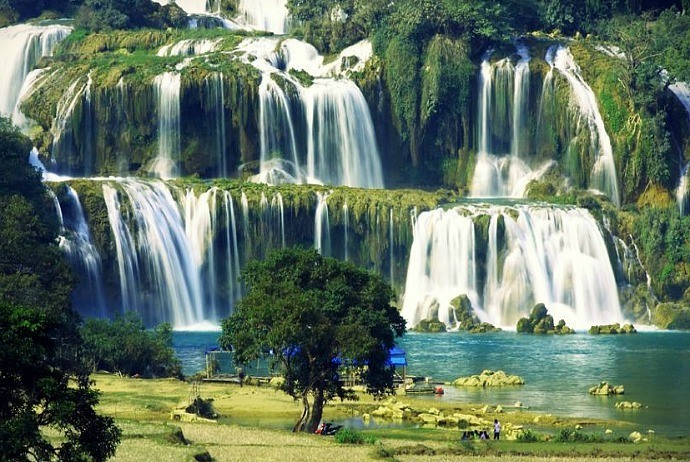 Among the most beautiful waterfalls in Vietnam, Gia Long waterfall is very renowned. This powerful waterfall is considered one of three famous waterfalls in Vietnam’s Central Highlands, which are Dray Sap, Gia Long and Trinh Nu (Trinh Nữ) flowing through Dak Nong province. This waterfall is named after the Vietnamese King who relaxed here due to its majestic and tranquil landscape. In Vietnam, Thanh Hoa province is a province of limestone pinnacles, rice paddies, and rivers. This province is about 150 km south of the capital of Hanoi. Its landscape is similar to the neighboring Ninh Binh province but is not as popular with travelers (just yet). 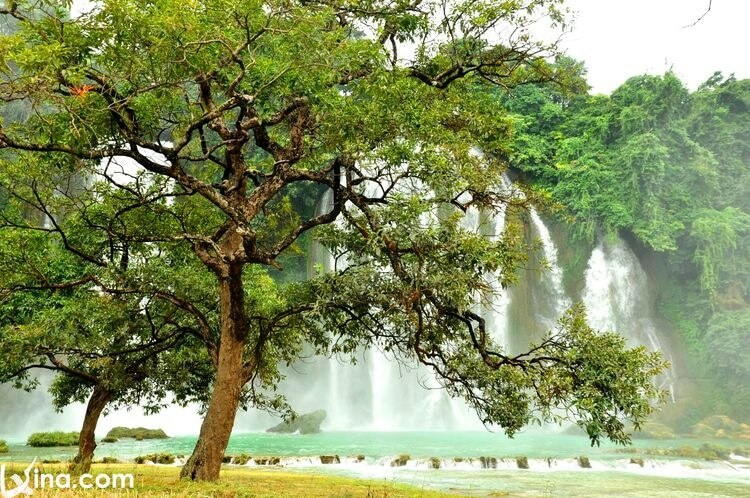 The province is famous for Sam Son beach, Pu Luong (Pù Luông) National Reserve and one of the best kept secrets of the country: Hieu waterfall – known as Thac May (Thác Mây). May Waterfall seems to lesser-known by international tourists, but it is a very romantic and beautiful place. The walk up to the top of this waterfall takes approximately one hour by foot but you will realize it is worth your time when you reach it. It is also called as “nine steps of Love” due to its majestic nine levels of waters, a perfect destination for couples to coming to enjoy the nature together. According to a local legend, the waterfall has 9 water levels which are thought to be the tracks of 9 ferries after they came back to the sky. 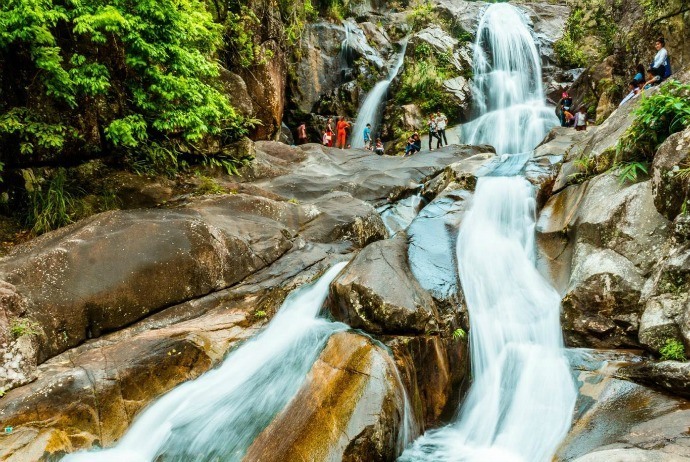 Being a magnificent and mysterious tourist destination for those adventure enthusiasts and couples to explore, May waterfall is worth mentioning in this list of most beautiful waterfalls in Vietnam. Dalat also has another named which is “the city of waterfalls and lakes” and among waterfalls here, Prenn may be the most famous. 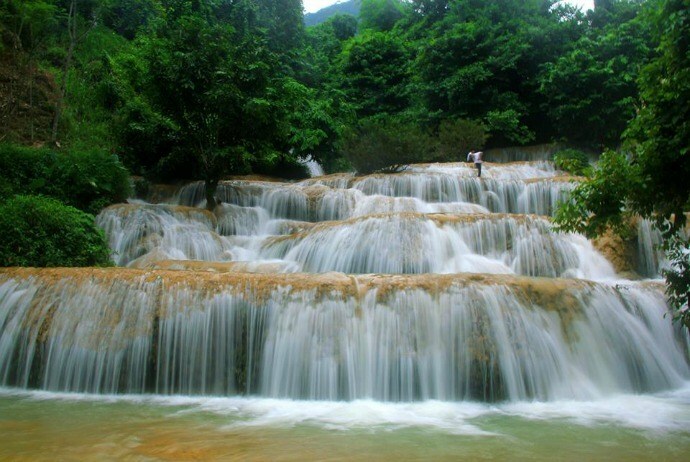 The waterfall is located at the foot of Prenn Pass, just 10km away from Dalat city center. According to Cham’s language, Prenn means “the land of invasion”. Local people say that this waterfall looks like a water-curtain falling down from 10 meters of height to a small valley which is surrounded by many charming wild flowers, romantic routes and rolling hills. This is also a stunning site for couples. 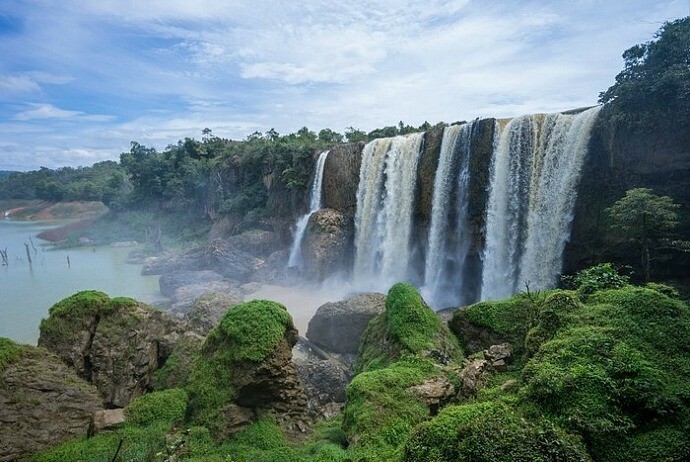 Situated about 50km south of Dalat city, Lam Dong (Lâm Đồng) province, Dalat is regarded as one of the most imposing and beautiful falls in the West highland with approximately 40m high and 100m wide. This is another gorgeous waterfall in Dalat which plunges down from stunning mountains of 40m in height, spreading over 100 meters of 7 levels of rock. When tourists see the mighty Pongour waterfall, they are surprised at hundreds of vivid wildflowers covering those poetic roads leading to this isolated waterfall. Layers on layers of water flowing down create cool air and magical white foam. 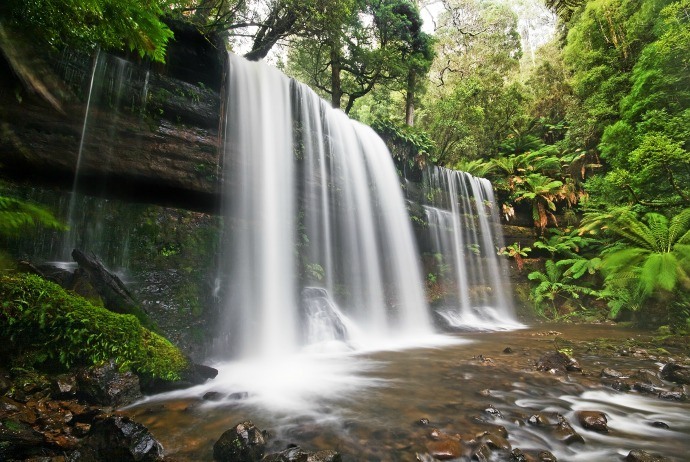 Surrounded by 25 hectares of unspoiled forest, this waterfall slips into a large number of sandstone from top to bottom. The landscape around this waterfall is very primitive. If you visit this destination in rainy season from April to October, you could see water flowing down into a big pool. In the dry season from November to March, travelers could admire big rocks at the waterfall’s root, where they could set a camping site in order to enjoy the cool atmosphere as well as charming beauty of the waterfall. In the dry season, from end October to November, tourists could see a breathtaking view of the nature as the wild sunflowers blossom and turn the road that leads to the waterfall into a completely light yellow. Bac waterfall, also known as Silver waterfall, is situated approximately 12km away from the Sapa town center. In order to reach this waterfall, travelers could go from Sapa center by a private car or motorbike in just 30 minutes. If you visit Bac waterfall in sunny days, you will see Bac waterfall looking like a white dragon which looks down from Ham Rong (Hàm Rồng) mountain. Lying at the height of 500m, Bac waterfall is formed by the water sources from Lo Sui Tong mountain peak. Visiting this waterfall, tourists will sink into a cool weather as well as extravagant landscape of the mountainous surroundings. For those who love trekking, they could combine trekking through Sapa valley into their tour of exploring Bac waterfall. This is the most famous waterfall in Vietnam. 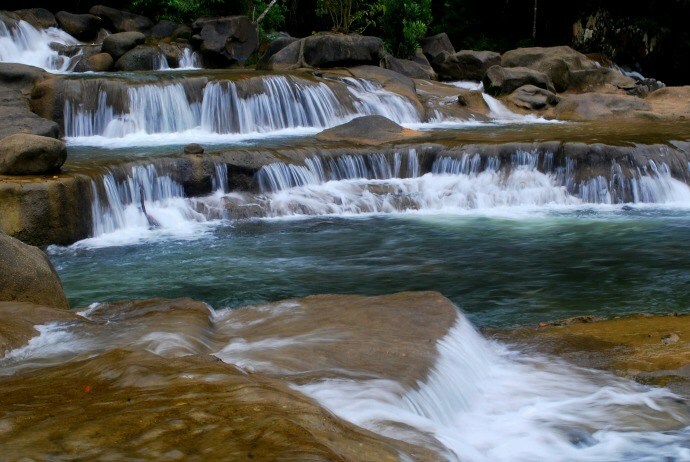 The reason behind it is that Ban Gioc is one of the 4 biggest cross-border waterfalls worldwide. Situated in the Northeast of Cao Bang province, this waterfall is 200m in width and 70m in height, offering a stunning spot of 3 layers of cliffs among the rich green, picturesque background. This breathtaking sight bares a fresh, graceful, quiet beauty of the water, warm and pristine of ethnic villages and pure beauty of forests. Ban Gioc waterfall is a worth-visiting destination in the trip to the Northeast Vietnam. The name of this waterfall is derived from the last emperor of Vietnam – Bao Dai. It is said that the emperor stopped here in his hunting trips to this region, during which he as well as his royal entourage hunted wild elephants and tigers among many magnificent animals. The waterfall is far from a beaten path and this area has just been development as a tourist destination recently. So far, the tourism development has been tasteful and subtle, maybe suggesting a new approach by those tourism authorities of Vietnam. The modest entrance to Bao Dai waterfall leads to peaceful gardens in which there are some attractive wooden houses. Pathways and stone steps through sheer rock will lead down to Bao Dai waterfall. At the height of 70m and spreading over 100m, these waterfalls are considered the most spectacular and biggest ones in this list. 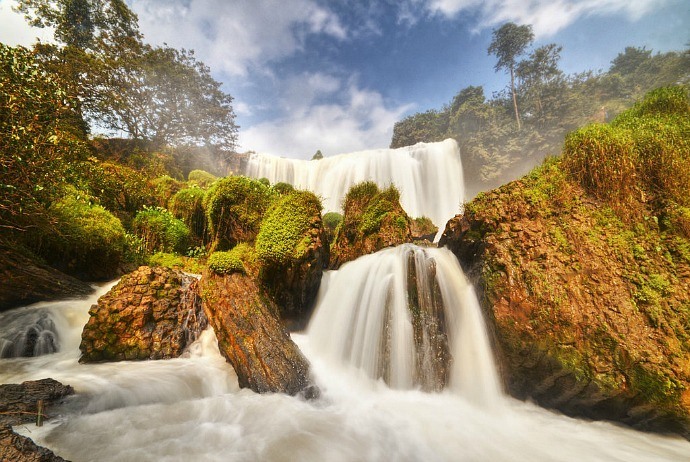 Situated in Khanh Phu (Khánh Phú) Commune, Khanh Vinh (Khánh Vĩnh) District, Khanh Hoa province, Yang Bay waterfall, known as Thac Troi (Thác Trời) waterfall, is home to many grandiose falls as well as dense forests that attract a large number of travelers in recent years. With the height of 100m above of sea level, the waterfall lies in dense primitive forests and mountain ranges with a cool climate throughout the year. Going 45 km far away from Nha Trang city, you will reach Yang Bay waterfall, which is not only beautiful but also comes with a legend. Here, you can also discover the countryside with the daily life of local people, the ethnic Raglay minority village… when touring around Yang Bay park using electric car, sightseeing Yang Bay as well as Yang Khang waterfalls, swimming in cool water, resting by the waterfall, and having lunch at Yang Bay restaurant will bring to you an unforgettable experience. 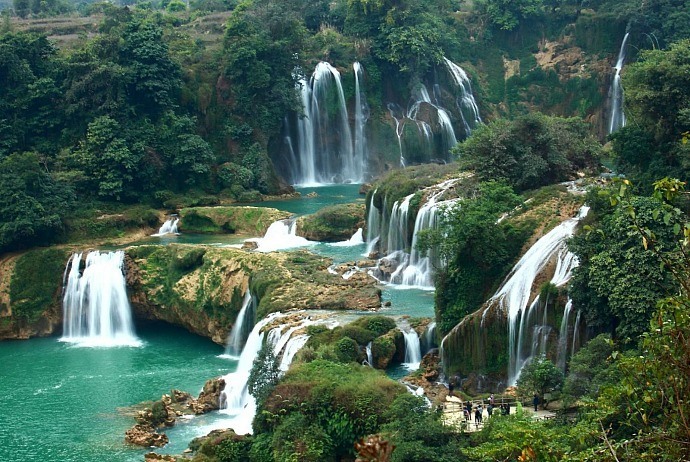 These waterfalls are hidden in the central highlands of Vietnam. 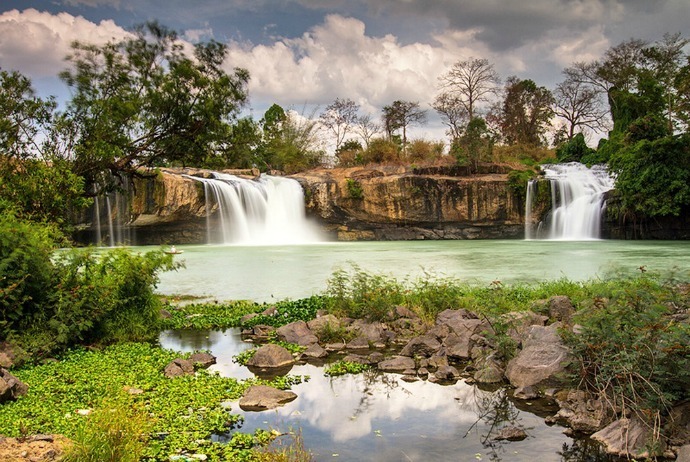 Being a system of three waterfalls, about 30 km away from Buon Ma Thuot (Buôn Ma Thuột) city, Dray Nur, Dray Sap and Gia Long waterfalls could be accessed through different routes but if you are short in time, you can choose to see Dray Nur – which is voted as the best among them. According to local people, the sound of these waterfalls is said to be the sound of whispers that tell a story. Approximately 130 km south of Dalat city, there is waterfall which is considered one of the highest as well as most accessible waterfalls in Vietnam. The waterfall is situated in a park which offers a vertical cable car riding to the top. Take a short walk, you will arrive at the 90 meter-tall waterfall which you could explore through different paths. Here, you could expect to enjoy a little soaked. 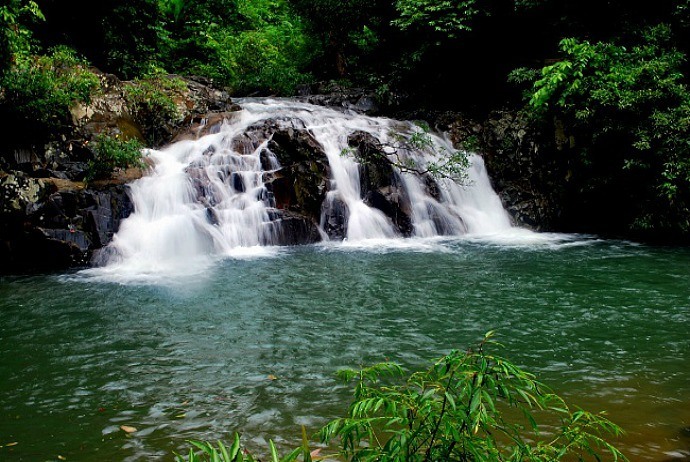 Throughout Phu Quoc Island, there are a lot of waterfalls and streams. 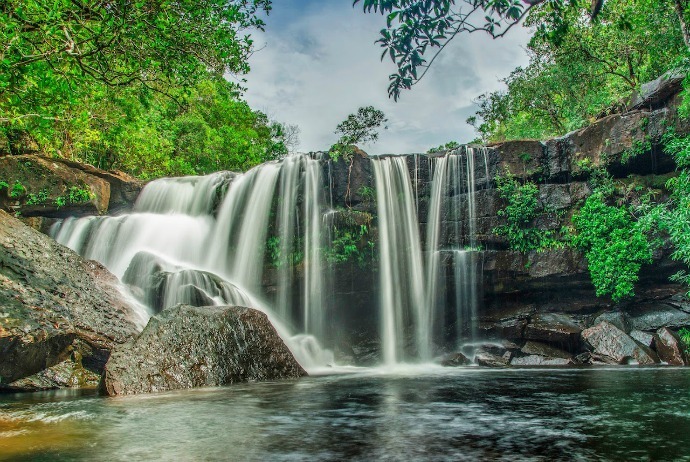 If you have been to Phu Quoc, chances are you have come across one of such waterfalls and the most popular is Tranh waterfall. The water offers a cool mist in the air and makes for a refreshing dip. Having pristine natural beauty, Binh Lieu mountainous district in Quang Ninh (Quảng Ninh) is well-known as an attractive place for those tourists who love adventure. One of the highly recommended destinations that not many people have explored is Khe Van waterfall located in Huc Dong (Húc Động) Commune. 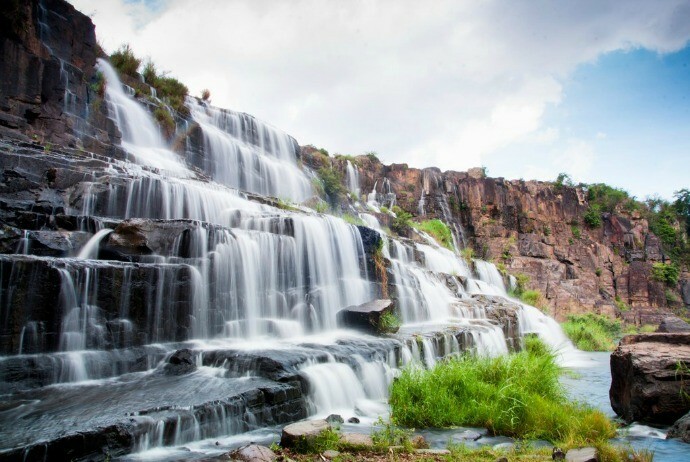 When coming here, tourists will be impressed by the imposing three-storey waterfall, particularly in the rainy season (from May to August) as the white water flow creates picturesque scenery. This waterfall is about 100 meters in height, running from the Khe Van – Thong Chau (Thông Châu) mountain range at 1000 meters above the sea level, creating three different water layers. Each layer has special features. The top is the large stream of waterfall flowing from the cliff right down to a large lake. Grass and flowers on that cliff promote the view. There is a complex of imposing angled stones that scatter under the water, creating a breathtaking natural landscape. The second layer is split into two small waterfalls that run next to each other. The first waterfall flows down to a wide lake and streams. The flat and large stones are perfect places to sunbath and rest. The lake is a natural swimming pool that invites travelers to immerse themselves in the fresh, cool water. Khe Van Waterfall, in reality, is not only picturesque but also possesses a cultural aspect. It is the place where San Diu and San Chi ethnic couples go on dates and sing the “soong co” (Sọong Cô) which is the folk song of their own groups. Those ethnic groups strongly believe that the 4th day of the 4th lunar month is not a favorable day of working. If they plant the trees, trees will not blossom. If they build houses, the houses will collapse. Therefore, they set aside all o work in order to have fun at the waterfalls, streams and lakes of the area. Despite the ethnic interest and beauty of the site, tourism has no developed there and tourists could just sleep at the homestays. However, this site still keeps an attention of backpackers due to its pristineness. Backpackers often stay in the houses of residents, enjoy local food such as boiled crabs and snail and grilled fish. At night, those young backpackers will gather around the bonfires. After dancing and singing, the local host will give them boiled buffalo horn-shaped cakes. Guests could take part in the process of wrapping the cake with local women. It is not too hard. The stuffing contains sticky rice and mung bean. People take advantage of bamboo leaves to wrap and then boil the cakes in order to fete those hungry travelers at midnight. Situated in the eastern part of Quang Ninh (Quảng Ninh) Province as well as bordering China, Binh Lieu District attracts tourists with its serenity, wild beauty, diverse ethnic culture of groups like San Diu (Sán Dìu), Dao, and Tay (Tày). For those people who love trekking in Vietnam, they could choose different routes to explore the mountain areas. A lot of people ride motorbikes as well as go trekking in order to enjoy the spectacular view and contemplate landmarks along the borderline plus with Hoanh Mo (Hoành Mô) Border Gate. A few border markers are clearly placed on the road and very easy to find while others may be hidden on fields and mountains. The falls seem a little more off the beaten path, yet they are really worth your trekking. To explore Ba Ho (Ba Hồ) waterfall in Nha Trang, you can pick up a motorbike from tourism agents. In order to get Ba Ho waterfall, you just need to go through 27 kilometers of driving north along the coast. After that, you hike up for about 25 minutes to the first of three waterfalls that you could swim in. Ba Ho means “three pools”. Ba Ho, among other waterfalls in Vietnam, is very refreshingly natural and quiet. The base of these waterfalls is where you leave your bike and take a lovely trek through a lot of stepping stones as well as rocks. You will get sweaty at this stage, and your attempt will be rewarded by a wonderfully refreshing dip within the cold and crystal clear pools under the waterfalls. There are a few pools with various heights which are deep enough to jump in nearly year-round as long as you are comfortable with a chill. 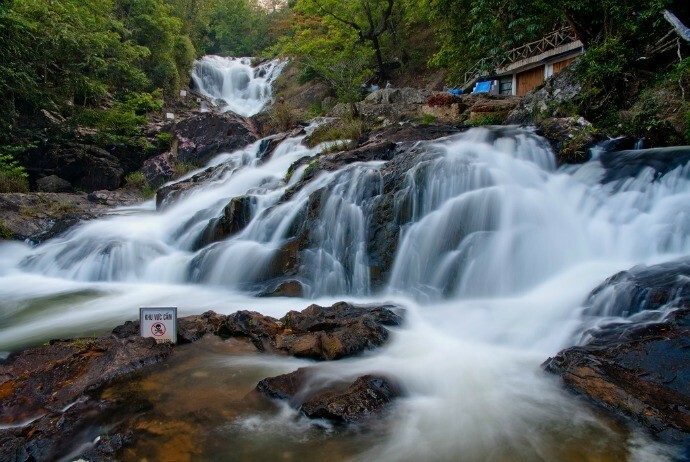 Situated beside the National road 20, and 5km from the centre area of Dalat city, Dalanta waterfall is a tourist attraction which has an area of 312 ha and set amidst the preservation forests. At the foot of Dalanta waterfall, the stream flows slowly via cliffs and flow onto a big hole named deadly abyss situated between two separate vertical cliffs that have a height of more than 40 meters. Tourists could walk down to Dalanta waterfall or they could take the roller-coaster to this spot. There are some adventure activities for tourists trying here like climbing the cliff, discovering the forest and going along the stream to get to Prenn Bridge. Because of the proximity of the park, you could expect a lot of tourists visiting here, including many Russian tour groups. But, do not let it turn you off. The waterfalls are really decent and the trek is scenic. The Dalanta waterfall falls from the distance of 20 meters, worms via many steps of rock-slits before hiding itself inside the dense jungle, alternatively flowing both in and out of sight which challenges the curiosity of travelers. There are glossy and beautiful rock slabs where the fairies from heaven legendarily used to have a bath here and get amused. That is why is also called Fairy Stream. These are 17 most beautiful waterfalls in Vietnam. Why not visit one of them? Pack your luggage and book a tour to your waterfall choice and you will not regret at all!